A National Transport Company with strong core values and the safest possible standards for our work environment. Rocky’s Own Transport is a unique and renowned consistent provider of high quality service. Receiver of three of our nations and industries highest awards “Advance Australia” 1995, “National heavy driver of the year 1991”, BRW/ANZ “National Regional Company of the year 2008” are testimony to our statement of values being, “all different all equal”. Established in 1985, the firm’s management culture and intellectual proprietary of “emotional intelligence” has delivered a highly professional and dedicated workforce. Our people are our shareholders, they enjoy weekly franked dividends in their pay and share in the annual profits with access to our company’s financial statements, total transparency, total trust and appreciation of “self”. 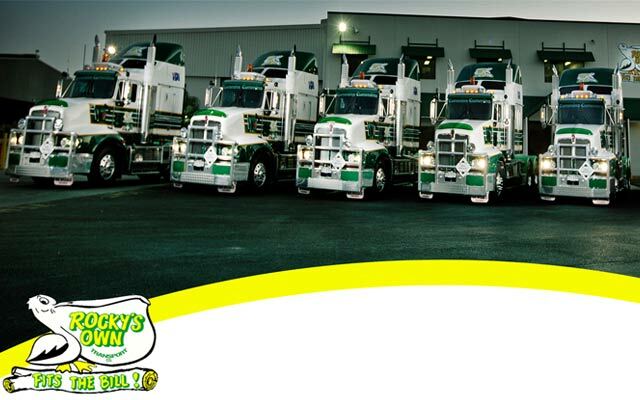 As a national industry leader, Rocky’s Own Transport Co has been, since 1990 a “pilot” in “Fatigue Management” “chain of Responsibility” compliancy and accreditation, in partnership with the Qld state Government and federal jurisdiction. Providing quality “risk management” for our customers had earned our firm an extensive portfolio of blue ribbon accounts. With an extensive scope of operations, Rocky’s Own specialises in the provision of service excellence for difficult and complex freight and logistic tasks.